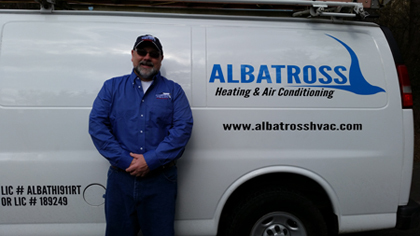 Testimonials - Albatross HVAC Inc.
What others are saying about Albatross HVAC Inc.
Dear Ryan, Rusti and I have relied on your services now for nearly 15 years. The relationship started shortly after we moved to Portland in 1996 when our furnace broke down in the middle of an ice storm. How lucky we were to have found you. Because of your willingness to come to our house late in the day to get our furnace working again, we have been more than happy to maintain the business relationship for all of these years. Please feel free to use us as a reference anytime either for potential new clients or an existing client that is considering a new installation. We rely on your regular servicing of both our heating and air conditioning systems to keep everything working correctly and efficiently. We are particularly appreciative of the advice and ultimate installation of the heat pump and air conditioning system that you installed a couple of years ago. Your experience and attention to detail during the planning process made for a trouble-free installation. The post installation follow up covering the learning curve we needed to operate the heat pump properly was also greatly appreciated. And equally important, we found your pricing very competitive. We could not ask for a better relationship and would strongly recommend your services to anyone considering a new heating and air conditioning system or entering into a regular service agreement. – Sincerely yours, William G.
– Sincerely, Sister Mary Immaculate, S.R. – Sincerely, Gene and B.J. S.
– Sincerely, David and Laura K.
Personal Service Guarantee My Name is Ryan Albertus and I will be taking your call directly, as well as handling your project personally. I guarantee that you will be taken care of to the best of my ability. Maintained by PC Rescue Wiz - computer repair Vancouver WA & web design service.